Garage Plus Storage LLC is one of the most unique storage facilities in the country! 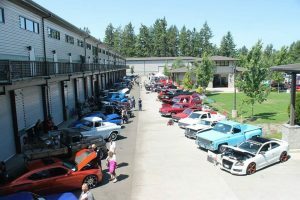 It is a 20-acre storage facility located in Spanaway, Washington, south of Tacoma. 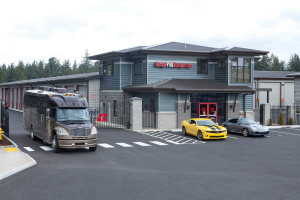 This is not your typical self-storage or mini storage type facility. Instead, it’s a complex housing 224 over-sized garages. Each garage comes complete with its own electrical and security system, and heated with in-floor radiant heating. The ceilings are 22’ high, which allows the use of car lifts, if desired. Some units also have lofts allowing for office or lounging space above the storage area. The extra wide and tall doors make it easy to back in that RV, boat or other vehicle. These garages ARE the ultimate Man Caves! In developing the project, the owners went through an extensive process with the county to gain an “active use” storage designation. Almost all other storage facilities are simply passive storage. At Garage Plus, you can actually work on projects in your garage just like you would in your home garage, only better, because it’s designed with the lighting, electrical and other systems to support that kind of work. Many users have car lifts so they can more easily work on their project car, or simply store their prized possession with peace of mind. While many users store and/or work on their cars at Garage Plus, you will find a wide variety of other uses, such as storing business inventory, hobbies of all types, boats, RV’s, motorcycles, and just about anything else you can imagine. If you have a hobby or interest that just won’t fit in your home or garage at home, this is the place. There is also a show park and clubhouse on-site as well, with several flat screen TV’s, pool table, fire pits and meeting rooms if you want to just hang out, chase away the winter blues or enjoy the outdoor fun in the summer. There’s even a car wash, too. Garage Plus Storage is a terrific client and we at Romero Park look forward to their continued success, and working with them for many years to come. For more information on units, future projects, and additional photos, visit http://garageplusstorage.com/ to learn more.